Don’t forget to enter the $10 Etsy Gift Card Giveaway and share your Granny-Spiration projects in the link up! Visit my Iced Edge Granny Square Slouch Hat to enter the giveaway and link up. Even if you entered already – the timers restart every day, and you can now enter again!! 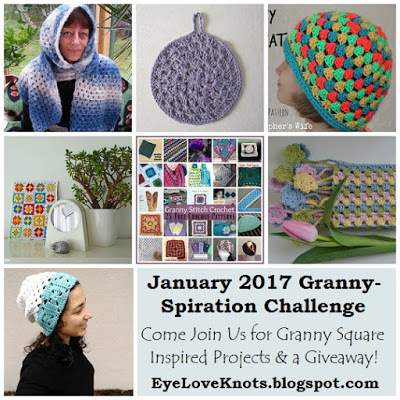 Keep working on your Granny-Spiration projects too because we’ll be back with more projects for you Saturday, February 4th with another link up and giveaway! Hooded Scarf – Hakelfieber Austria. This Hooded Scarf looks so warm and cozy! Wish I had one wrapped around me right now! Post contains general instructions for creating your own – you will need to translate – along with charts. If you are intimidated by it – don’t be! Even Sandra says it was easier than she though it’d be! Granny Stitch Dishcloth – Crochet is the Way. Looking for a new addition to your bathroom or kitchen? How about some Granny Stitch Dishcloths! You can work them up quickly and in a variety of colors. Why not even try holding a strand of the cotton yarn and a strand of scrubbie yarn? This is a free crochet pattern, and I especially like that it has a loop for hanging! Granny Canvas – Kat Kat Katoen. This canvas is so awesome! I have some 3″ squares that I worked up for a tutorial, and have just had them sitting around trying to decide what to do with this. I was thinking some sort of wall art piece. This Granny Canvas is a great way to use up spare squares you have sitting around like me, or those squares in your WIPs bin that have yet to make it into that blanket you started three years ago ;). Sigrid also has a great Project-GrannySpiration pin board for inspiration if you need some extra, though make sure you stop by the link up to see what other’s have been up to – lots of inspiration there too! 25 Free Crochet Patterns – Rhelena. [R]Helena put together this awesome round up of 25 Free Crochet Patterns with a fun variety of projects! You may also like this Holiday Scrubbie Dishcloth designed by Helena for her Crochet n Crafts blog. I have been dying to try out the scrubbie yarn – though I’ve it’s a little difficult to see stitches, so I might try what I mentioned for the Granny Square Dishcloth – one strand of cotton yarn, and one strand of scrubbie yarn. Child’s Granny Stitch Scarf – Atelier Marie-Lucienne. Marjan created this scarf for her niece’s birthday. What a great idea! My niece, Kayliss, and little cousin, Madison, LOVE getting scarves and hats especially if they have pink and/or purple in them and fringes – or in this case, dangling flowers. This free crochet pattern also includes charts, and shows an adult version. It’s amazing the transformation with a simple color change. There’s also a matching hat (and free crochet pattern) – Granny Stripe Hat. Lastly, my Iced Edge Granny Square Slouch Hat! I really love how this came out.